At Complete Wellness Chiropractic, we work hard to help our patients achieve pain relief and optimal health through chiropractic adjustments and an overall approach to complete wellness. Our Wellness Center focuses on gentle chiropractic while also combining massage, acupuncture, weight loss programs, body sculpting, spinal decompression and correctional rehab for auto accidents and poor posture. Take a look at the success stories of our patients below! Dr. Becker and his staff are wonderful. I came to them with lots of sciatica pain. I followed his treatment plan and the pain had been gone for over a year. Thanks Dr. B! After going to many chiropractors and physical therapists for 18 years for my scoliosis and coming to a dead end every time, I finally found Dr. Becker. I was dealing with severe hip pain coming from my spine when I started. After just one visit my hip felt looser and now the pain is gone after seeing him for about three weeks. He deals with the complete person and uses techniques I hadn't seen before. Highly recommend! Dr. Becker is genuinely concerned for his patients well being. I have been seeing him for 3 years. I came to him with dizziness spells, headaches, and tingling in my hands and arms due to a forward head posture. He gave me options and I chose the corrective path-I was ready to address the source and tired of treating the symptoms. I felt better within my first week of treatment. I continue to go for maintenance and Dr. Becker is always proposing new treatments to help me continue to feel and stay better. He is super knowledgeable and loves to share the information he finds. I would highly recommend Dr. Becker. Dr.Becker is awesome. He has brought my husband and I to complete wellness and we're holding strong. Totally blessed by his gift. We love Sheri and Dr. Graham too! I won't go anywhere else. Please check him out, you won't be disappointed. 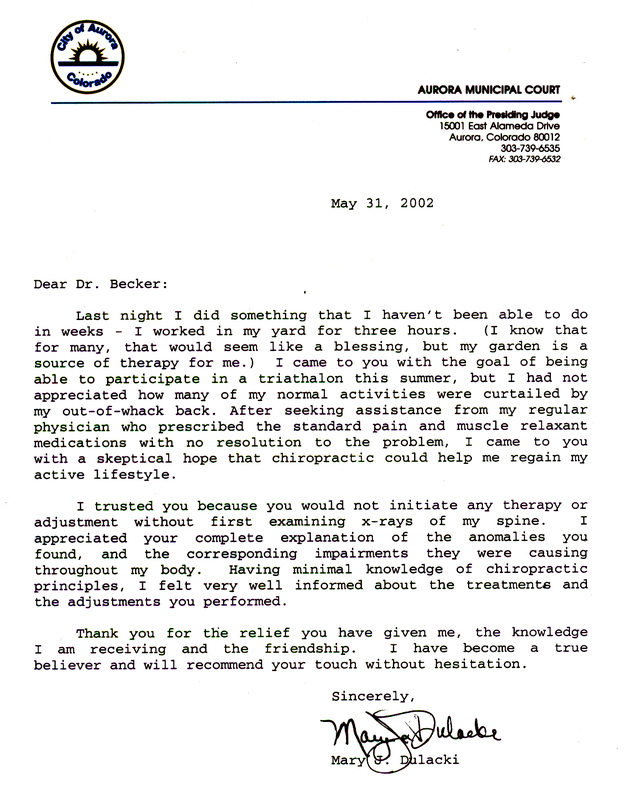 Dr. Becker, I have been getting adjusted since I was in Elementary School and have been to many Chiropractors throughout the years since. I can honestly say that I have never experienced one as personable and talented as you. You truly have a gift that I hope many others will have an opportunity to experience!